Programme governance is good for small organisations implementing complex change initiatives. Here we will illustrate a situation where it is appropriate to implement a programme organisation in a relatively small company that has a couple of physical shops and an online web shop. Your software systems have evolved over the years and you have now decided that they need to be rationalised. You have a legacy financial control system, another logistics system and various other systems for things like HR etc. Originally your business started off selling from physical outlets in two towns about 100km apart. Seven years ago you decided that you needed to expand your customer base so you initiated a project to deliver an online channel. You have noticed that the business is outgrowing the current systems and work flows. There are new systems on the market that are now more affordable for smaller business like yours. With one of these ERP systems you will be able to make improvements in work flows as well as data management. At the same time you would like to upgrade the on-line channel (web shop). Do you establish a project organisation or a programme organisation to see through this business transformation? After carrying out some discovery and design work you have identified an ERP system that can be set up to take care of your business needs for the foreseeable future. You also understand that the e-commerce web shop you have no longer has the capability to meet your business needs so you will build a new e-commerce web shop solution that will integrate with the ERP system and a new warehouse management system. You want this work done in parallel as this seems to be the best option from a business perspective and have chosen to work with two different suppliers who have the required knowledge and capability. 1: To implement the ERP and Warehouse management system the provider is likely to use a methodology which is tailored for implementing and tailoring the processes to suit the different departments in your organisation. 2: To implement the e-commerce web shop you are likely to use a lean and agile form of project management. 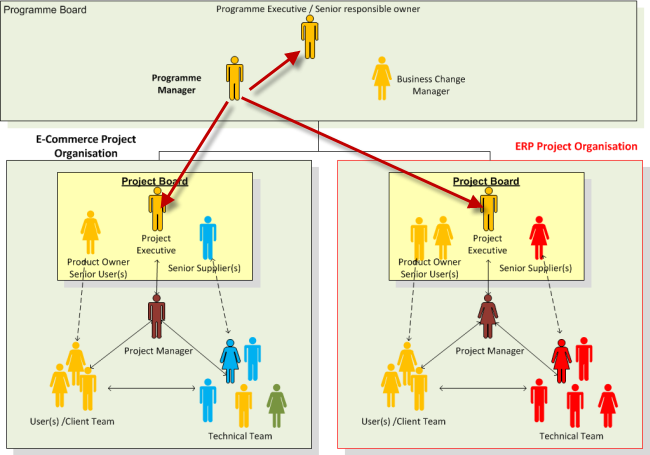 By using the concept of programme management you can allow the individual project teams to use different methodologies. At the programme level you can create a common facilitation, control and reporting process so that the whole change initiative is coordinated. There will be many interdependencies between these two projects and normal operations of the business that need to be planned and sequenced. Components and sub-components of the ERP system will need to be available in the development and test environments for the e-commerce system to be developed. This adds another level of complexity for both projects. It is in managing this level of complexity where a programme organisation can add value over running two independent projects. At the programme level it is possible to monitor the work and help re-prioritise resources to keep the two projects synchronised. The programme manager reports to the programme executive and in this scenario he also has the role of project executive on each of the projects.